1 1/2 tablespoons 100% pure Extra-Virgin Olive Oil. In a small bowl, whisk together while truffle oil, olive oil, champagne wine vinegar, lemon juice, sea salt, and black pepper; set aside or refrigerate until ready to use. If refrigerating, bring to room temperature before using. Blanch the asparagus in lightly salted boiling water for about 3 minutes or until crisp-tender; do not overcook. Remove from heat and refresh under cold water; drain well. Toss asparagus with enough truffle vinaigrette to lightly coat. 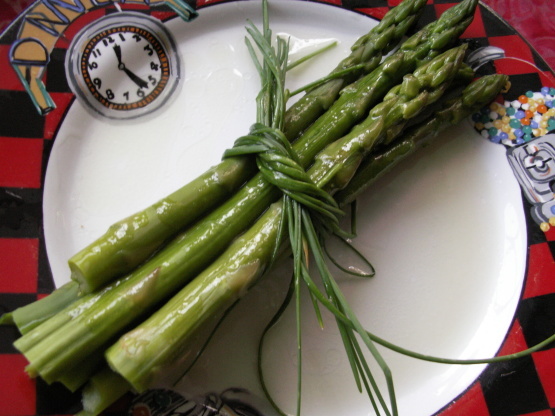 Arrange asparagus on serving platter or individual serving plates.